WOW!! We set a new record here at One Crazy Stamper, we had 245 entries for our last challenge. Welcome to all new participants and hello to our returning participants. We hope you'll continue to check back and play often!! Please email ( lora at one crazy stamper dot com ) to claim your prize and add "January Challenge Winner" to the subject line. Please check back tomorrow for a new challenge, lots of inspiration, and a fabulous new prize up for grabs. Good Wednesday morning and welcome to my first post as a new design team member for One Crazy Stamper. First off, let me introduce myself and tell you a little bit about me and then show you my project for today. Patterned Paper ~ Dovecraft Princess Fairytale 6" x 6"
Image ~ Whimsy Elizabeth Bell Designs "Sunkissed"
Thanks for joining me on the start of my exciting journey on this design team. 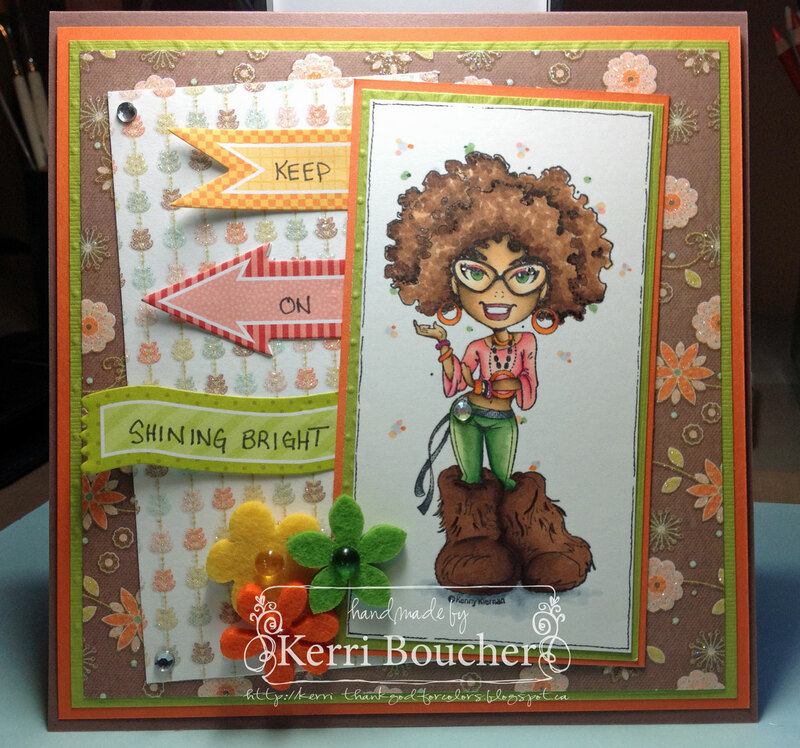 My card today features Follow Me from Whimsy Stamps, which I colored with Copics. The dp is from First Edition's Hideaway collection, the border punch is from EK Success, and the pearls were made with the Yellow and Light Green Viva Decor Pearl Pen. 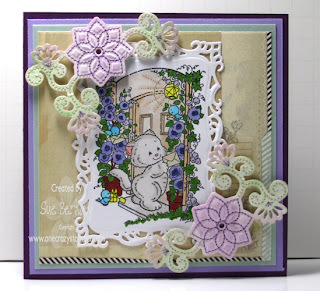 A few months back, I made this shadow box card and today I wanted to show you the quick tutorial on how to do this. I will admit that I am REALLY intimidated to try new techniques, especially special folds on my cards. Can you relate? There are some amazing folds that I love the look of, but never have tried. So I pushed myself out of my comfort zone and started small. This is so simple anyone can do it. First take a 12” paper and cut it to 12 “x 4.5”. Then I scored my paper at 5.5” and again at 6.5”. This gives you the following results. 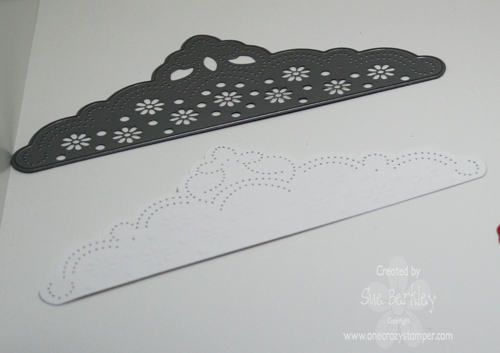 Next I trimmed my patterned paper and glued to the front of my card. This should be just under 4.5”x 5.5”. Then I used a Spellbinder’s Nestabilities Die to cut out a window. I stamped my sentiment (or image) on paper for the inside of the card and decorated the front. The last step is to staple/glue or add a brad to the top of the card to close it. Even if you don’t try this particular folded card, I hope you try something new and step outside your comfort zone. Its fun to do every once in a while! It is the end of the week and Sunday, has rolled around and for today's post for One Crazy Stamper I have a card as well as a tutorial using some of the Cutting, Embossing, and Embroidery dies by Joy Crafts. I have a co-worker who is retiring and I will be giving her this card. 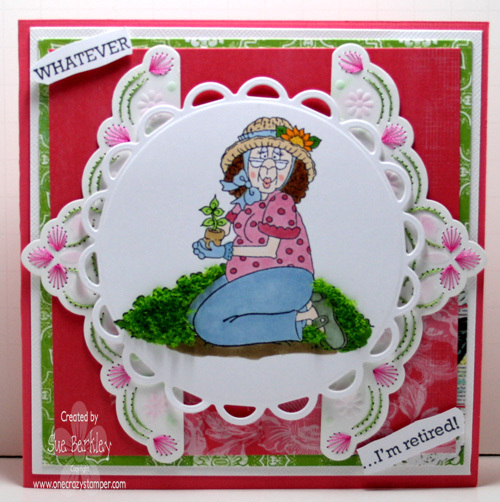 I have used Gardening Gertie and sentiment from the latest release by High Hopes Rubber Stamps. Miscellaneous: Flower Soft - Shamrock Green, Pearlescent Chalking Set which was added to all of the embroidery dies. These dies are cut and embossed in the usual way, using any die cutting machine. Some of the embroidery holes might need extra piercing. I have used all three of the stitches listed below on different dies; some just a back stitch and others all three of them. These dies do take a bit of time to stitch. When starting to stitch start at the first hole of the area you are starting with and pull the needle through and leave 1 - 1.5 inches of thread at the back. Attach a piece of scotch tape to hold the thread in place. Do not knot the thread to keep it in place. I use Sulky thread which has a nice texture to it and the colours are vibrant and comes as a single thread. 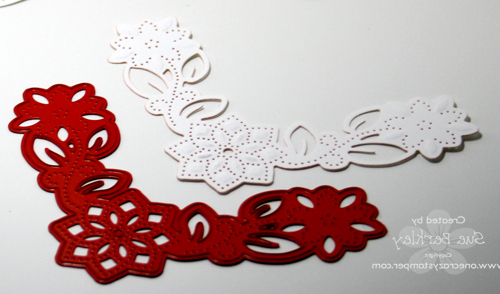 You could try embroidery thread such as DMC, but you will have to split it so that you have only one strand. 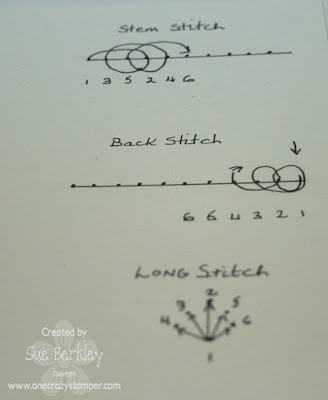 Stem Stitch: Bringing the needle through hole 1, you skip the next 2 holes on the front and go down through the next hole, skip 1 hole on the back and up through the next one. The stem stitch would be worked like this 1 - 2 (front), 2- 3 (back); 3 - 4 (front), 4 - 5) back etc. For a smooth curve, work on the inside of the curve. hole 1, then up through hole 3 and back down through hole 2. 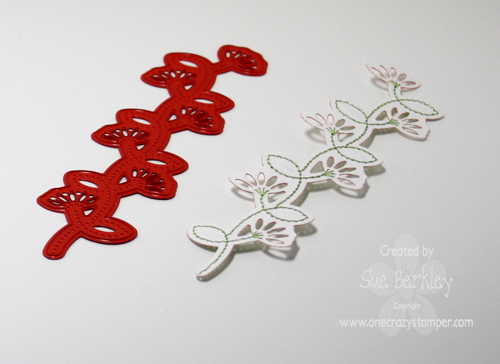 Long Stitch: This stitch can be used to do flowers and leaves. You start at hole 1, which is usually at the bottom of the shape, coming up through the back and go to hole 2 (see sample), then down and back up at the starting hole. Using pink and green Sulky thread both the long and stem stitches were used in the sample above. I added some Pearlescent chalks to the embossed parts of the die. This is the die that is on the front of the card. flattened so that they lie nicely. 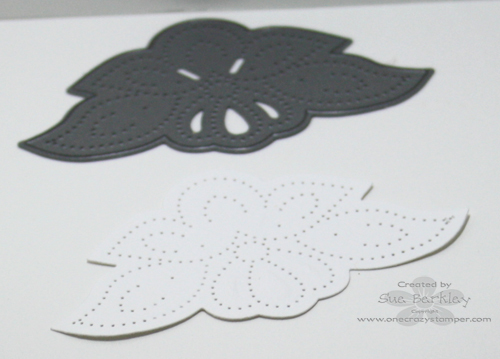 I added some Pearlescent chalks to the embossed areas of the die and this on the inside of the card. Using Lavendar and Green Sulky threads, a back stitch was used to stitch on the Cut, Embossing and Embroidery Die that is shown above. This die was used on last week's card called Kitty Post. The back stitch was one done using green Sulky Thread. 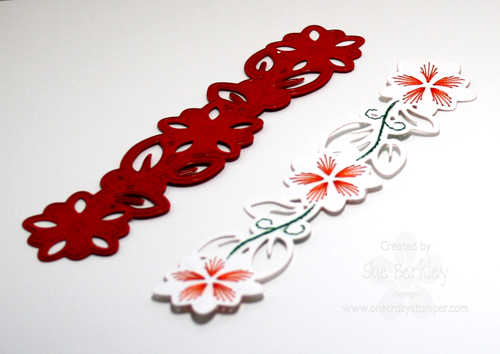 Using a reddish orange Sulky Thread, the flowers were done using the long stitch while using green thread the stem stitch was done for the rest of the die. You can see how I used this die at this link Snoesjes - Snoes with Dog. I haven't used this die yet, so it will be upcoming in the future so do keep an eye out for it so you can see what the finished product can look like. I didn't stitch this die, but you can see what it would look like here at the December Challenge. 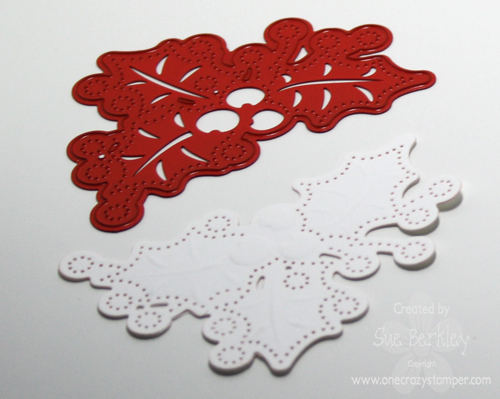 Lora does have the Embroidery Corner Scallop die in stock at One Crazy Stamper and hopefully she will be able to obtain some of the others and new ones if they are available. Hope you enjoyed the tutorial and want to try a new technique. There are still a few days to enter this month's challenge which is "Anything Goes" for a chance to win a Little Darlings Stamp Prize Pack from One Crazy Stamper. Good morning crafters! Today I'm showing a card made with In & Out Just Because by Flourishes, this is a perfect stamp set for that any occasion card or project. I've made this beauty for a friend who I haven't seen in a long time and just because I felt to send a hello and some love with a handmade card. We are all blown away by the amount of entries in our "Anything Goes" challenge, there is still a few more days to enter so keep them coming! Have a super Saturday crafty peeps! Hello and Happy Friday! Did you know it is only 11 Month Till Christmas!!!??? Again this year I have decided make a goal to complete 2 Christmas cards a month so that I can stop the stress of completing all my cards in time for the special season at the last second and I will be posting them on my blog every 25th of each month. One Crazy Stamper has an amazing selection of Winter and Christmas stamps to choose from all year round, so there is never any reason why you can not get a head start on your cards too! I hope that I may have inspired you to get a head start on your Christmas cards this year as well. Be sure to pop over to my blog as this year I am going to continue the fun little Christmas Hop like last year, but with a little twist - Pop over to follow the hop and get inspired to create your own Christmas projects early! Good day to all of you wonderful peeps out there...I do not know about you guys but it is darn cold in Massey Ontario!! Yesterday the buses were cancelled and apparently they will be as well tomorrow...As you guessed I am writing this last night!! I do have a card for you today it is a SC image do not laugh yes I am addicted...Have you seen the amazing preorder for the new images..if you click on this.. http://www.onecrazystamper.com Also the products I use can all be purchased from this awesome store...Prices are awesome..Ok now I choose Cherry Blossom...when I saw this stamp it made me think of Mulan and I love that movie... So without further ado here she is..
Golden Rod 1034 deepen the shading in yellow areas.. Dark Umber 947 tree and hair..
well there you have it, have a great day be safe, happy and warm..hugs to all!! P.S do not forget to join us for the challenge!! Short and very late wonderful Wednesday post for today due to unexpected circumstances. 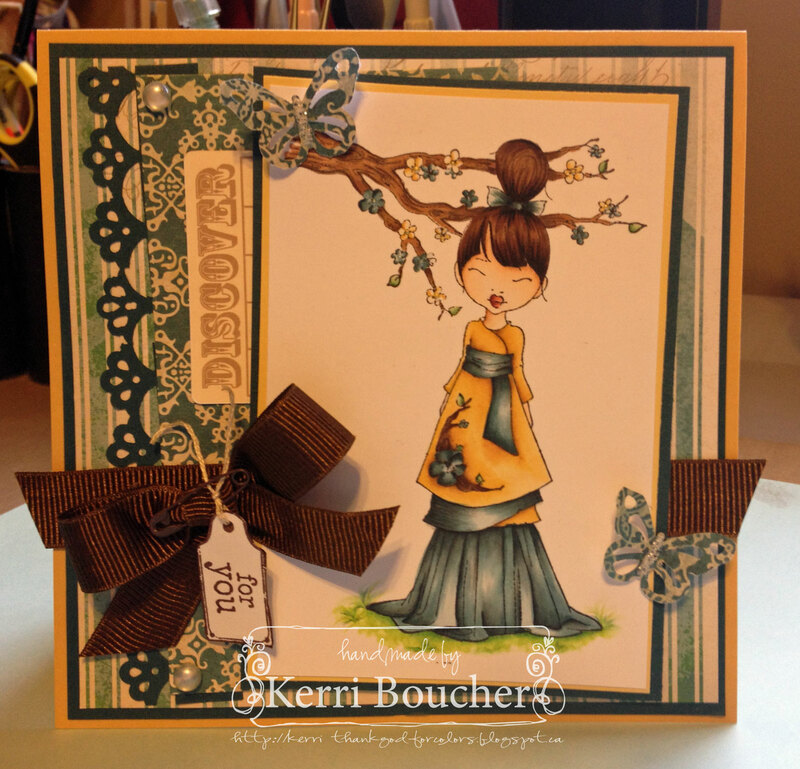 I've used an Elizabeth Bell stamp from OCS called Kaydance. Materials used: Xpress It blend cardstock, Copic Markers, Memento, Tuxedo Black Ink, Whimsy Stamp "Kaydance" SEI dp, MS border / corner punch. Take care til next time. Happy Wednesday to everybody - Shari M here today to do a quick post for Madge today. 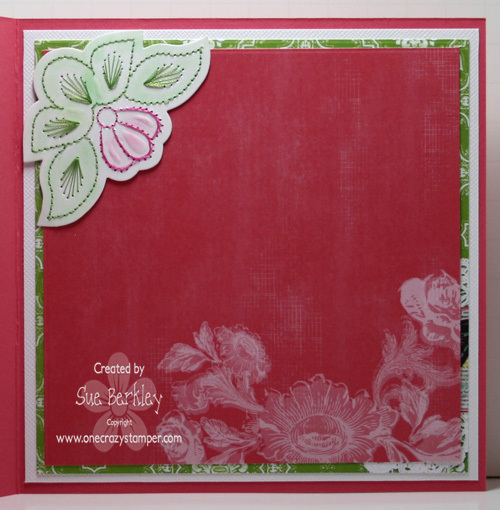 I am posting a card that I had on my blog recently that features several items from the One Crazy Stamper store. This gorgeous lady is "Zoe" from Saturated Canary. I have colored her with Copics and then added several colors of Prismacolor pencils and gamsol to give her more depth. The dp's are from My Mind's Eye Lost and Found 3 Ruby collection, and the sentiment is from Kraftin Kimmie ( Katherine ). The black pearls were made with the Anthracite Viva Decor Pearl Pen. 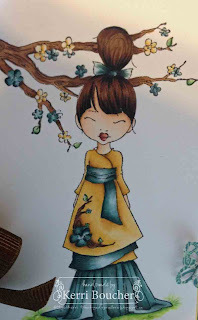 The image is colored with Copics, then cut and matted with Spellbinders Label 14 dies. The dp's are both from Bo Bunny's Powder Mountain collection, sentiment is from the Flourishes Snow Days set, and the snowflake die border is from Whimsy Stamps. You still have just over a week left to enter to win a great set of stamps in the One Crazy Stamper challenge!!! Just click on the icon at the top of this page to enter your project in our Anything Goes challenge. New Years Resolutions…love em? hate em? I love setting goals, I don’t usually do a big new years goal, but I have on going goals that I have set for myself. When I saw this image from Kraftin Kimmie, I thought of my bff and her dance exercise classes. She loves hip hop dancing to stay in shape. I haven’t given her classes a try yet, but I have been doing cross fit for the past 3 months and I love it. I think you need to find what peaks your interest fitness wise and stick to it. Did you set a new years goal? Do you have a WORD for 2013? I’d love to hear about it, if you do. It is Sunday again, and boy do I wish there were more hours in the week. The days seem to fly by. 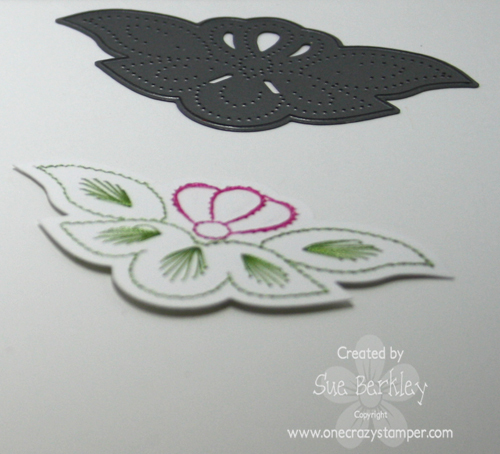 For today's post for One Crazy Stamper, I have used this cute stamp called Kitty Post that was designed by Penny Johnson for Stampavie. 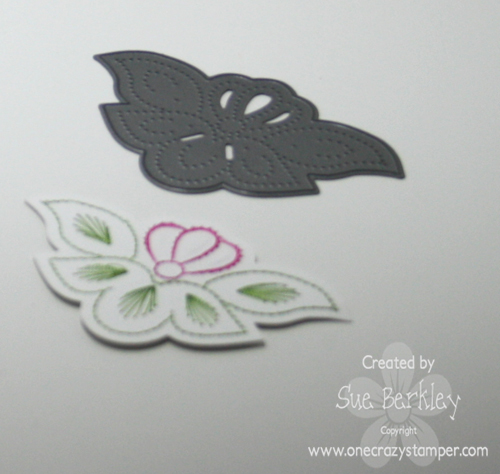 I have used another Cutting, Embossing & Embroidery Die from Joy Crafts which I stittched using a green and lavendar shade Sulky Threads, and then inked with the Versa Magic Chalk Inks Spring Pansy and Aloe Vera. I will have a tutorial next week on using these unique dies. 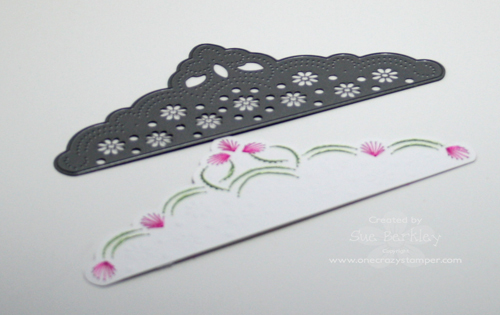 I definitely like adding some embroidery to my cards. As I couldn't decide on what sentiment to use, I didn't add one at this time. Lora has new products arriving daily and amazing prices at One Crazy Stamper. So as Aaemie said yesterday "why not join the fun and get crafty with us and add your card to this month's challenge "Anything Goes". Have fun being Krafty and see you next week with the tutorial. Good morning! 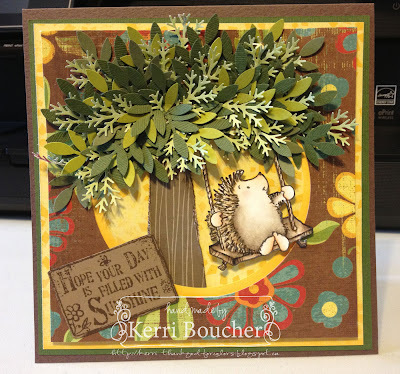 Today I have a cute card with some furry little guys who are from High Hopes new release. I first coloured them with copics then used prismas and gamsol. Ive never experimented with prismas before, but really did enjoy the look, I will be using them more in the future for sure! There are so many beautiful entries for the months "Anything Goes Challenge", why not join the fun and get crafty with us! Hello and Happy Friday! I hope that you are having a fabulous week so far! Today I am doing something a little different and not showing you a card! I know, shocking isn't it! Today I am going to show off one of my Christmas presents that I got from my wonderful girlfriend﻿ Sara along with my Copic hand chart that I have decorated using Color Me Janette from the Kenny K Collection. As you can see from the photo below I have all the BV's, not a big fan of the V's (not a purple lover, sorry), and have all the other colour families except the T's, N's and FV's - I am sooooo in love with Copic Markers, can you tell LOL! The picture below is usually how I have my table set up when I am playing in my Pink Palace - Markers in front all in my beautiful Copic Marker Holder that my friend Sara gave me for Christmas, all my Memento Inks on the top of my holder, 2 x Ott lites and hand chart to my left =) this is my favorite spot in my house LOL! I hope that you enjoyed today's post and maybe I have inspired you as well to do something a little different from the usual =) Keep in mind that you still have 12 days to enter this months challenge at One Crazy Stamper Challenge blog -Anything Goes! Good morning to all of my fellow peeps!! Today I have a Kenny K image her name is BABY BLING!! I have never coloured her before so I thought hey why not...I coloured her with my Copics and did my shading with my Prisma Pencils...I will list all of the colours on my blog...http://kerri-thankgodforcolors.blogspot.ca My Pattern Paper is from a paper pack called Summer Breeze..and I think the company is First Edition...My image was stamped with Memento Tuxedo Black..all of these supplies can be purchased over at One Crazy Stamper Store...(lots of sales happening...just saying) http://www.onecrazystamper.com Also do not forget to join us for the January Challenge...ANYTHING GOES...easy right...you could win some stamps who doesn't like stamps and free!! Have a great day!!! Kraftin' Relaxes Me! Can You Relate?! A dear friend of mine has a "Crafting Companion" and when I saw this stamp, I knew it was perfect image to color up for her Birthday this month. The stamp I used is from Krafting Kimmie, called Krafty Katastrophe. I can relate, with two little Shih Tzu's.... (my little Shitz). 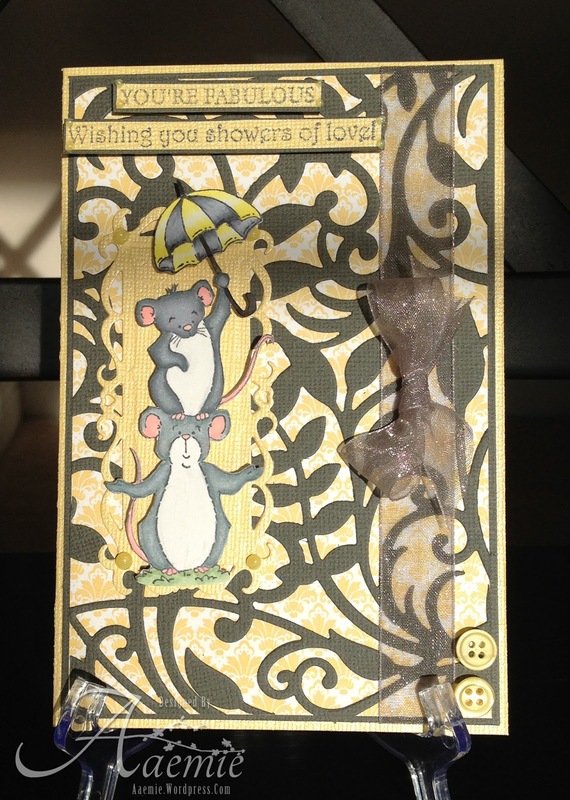 The Image was stamped onto Xpress It blend cardstock using Memento, Tuxedo Black. I used my treasured Copic Markers to color,then dabbed on copious amounts of glue and glitter (doesn't show up in the picture, of course). I colored the ink spill black, then added glossy accents to give it some "pop". A multifineliner pen was used to doodle around the edges of the dp. The flower was created using three flowers layers, all sponged with Tim Holtz Distress Inks - Barn Door. Doily, fern leaves, from stash. Hope this inspires you to get crafting, alone or not-so-alone. 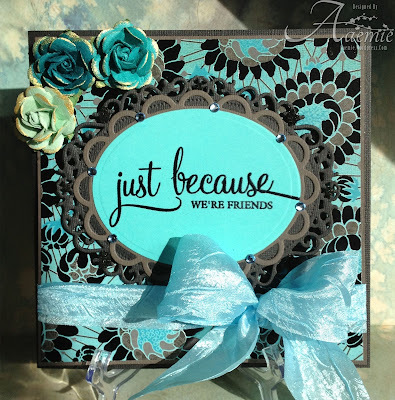 Be sure to drop in on the ONE CRAZY STAMPER STORE for some great bargains and the ONE CRAZY STAMPER blog for some inspiration with our January "Anything Goes" challenge.